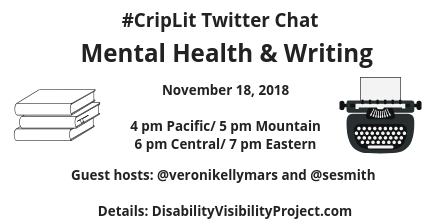 Image description: Graphic with a white background and text in black that reads “#CripLit TwitterChat Mental Health & Writing, November 18, 2018, 4 pm Pacific/ 5 pm Mountain/ 6 pm Central/ 7 pm Eastern/ 4 pm Pacific, Guest hosts @veronikellymars and @sesmith. Details: DisabilityVisibilityProject.com.” On the left is an illustration of a pile of books and on the right a typewriter. Both illustrations in black. You are invited to the fourteenth #CripLit chat co-hosted by novelist Nicola Griffith and Alice Wong of the Disability Visibility Project®. We are excited to have Kelly Jensen and s.e. smith join us in a conversation about writing, mental health, and the new anthology (Don’t) Call Me Crazy: 33 Voices Start the Conversation about Mental Health. Kelly is the editor of this anthology and s.e. is a contributor–we look forward to learning more about this groundbreaking collection of essays from them. Please note: This first question is for everyone, then we will ask several questions of Kelly and s.e., and then open the last 20 minutes for participants to ask their own questions to our guest hosts or Tweet their thoughts about writing and mental health. Q3 @veronikellymars: What was the editing process like and what led you to select these 33 particular essays? What were your intentions with the choice of these contributors?